Saregama has done an unique thing. 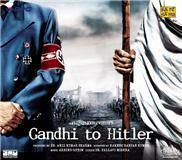 It is distributing the music of brand new film GANDHI TO HITLER on LP format. Saregama in its continuous endeavor to bring back the era of LP revived the format after 13 years, with their home production. Since then it has been launching its various timeless classics on LP format. GANDHI TO HITLER Produced by Dr. Anil Kumar Sharma, Directed by Rakesh Ranjan Kumar has scintillating musical tracks composed by Arbind-Lyton and soulful lyrics penned by Dr. Pallavi Mishra. This recently released saregama masterpiece and unique first ever musical soiree of two music legends and other music stalwarts, has nine distinctly written, classically tuned Gazals stylishly rendered to make this an Collectors’ item. The VIPs of the Music World of India and Pakistan have made a history under the label of India’s senior most and top music company saregama.